Trying to figure out how to deal with roaches can be overwhelming. A quick search on the internet gives you an insane amount of results and answers. In fact if you searched for what is the best way to kill roaches, you would have over 680,000 results to sort through. No one has time to go through all. I’m sure you don’t either right? No need to bother with all that. You only need the answers on this page to get results in the shortest amount of time. What I’m about to tell you is what I believe to be the best way to control and kill these roaches. Now before I go on, I will say that this removal method does use chemicals to quickly kill them. 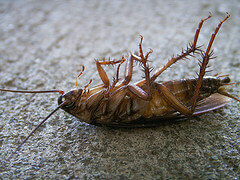 They work so fast the roaches will die within just a few hours of ingestion, or even just coming in contact with them. There are more natural and less harmful ways to kill them, but I’m assuming you’re looking for the most potent. You are searching for the best way after all. After hearing how deadly these chemicals are to roaches, I’m sure it’s raised a concern for you. If they can kill a roach that fast, will it harm me too? What about kids and even pets? I’ll be honest and say that I’m not qualified to give you a definite answer. You will have to contact the manufacturer of the specific product for a more definite answer. You’ll also want to to call your local poison center and ask them. Just read the labels use a little common sense and exercise standard safety precautions to be on the safe side. Cypermethrin is a synthetic (man-made) insecticide. It’s like “nerve gas” for cockroaches and other bugs. It works by attacking the nervous system and kills the target through paralysis. This stuff is lethal towards insects and it’s what the pros use when you pay for an exterminator to come in. Cypermethrin is a mimic of the real stuff that is naturally found in the chrysanthemum flowers. The reason it’s preferred over the natural stuff is because it stays effective for up to a month once sprayed. The natural stuff degrades within hours of being exposed to oxygen and light. Insect growth regulators are man-made bug hormones. Roaches exposed to these are unable to molt into adults. No adults means no reproductive capabilities. That boils down to no more multiplying. It doesn’t get every single one of them, but it definitely makes the difference. Adding roach baits is like kicking them while they’re down. Sounds a little nasty doesn’t it? But there’s no room for sympathies if you want it done right? Roach baits contain poison and a strong attractant that they can’t resist (in most cases anyways). In rare cases, the roaches infesting your home may actually be disgusted by the attractant. Should this be the case, simply try another brand, or make your own. Now before you start randomly spraying all over the place, you’ll need to determine where they can be hiding and where they frequently move through. I’ve already covered how to find these areas thoroughly in my other post so read about them there. Potential hiding spots were covered here and determining high traffic areas were covered here. You will need to spray these suspect hiding areas with Cypermethrin. These three things are often nailed in and usually have a small space behind–where roaches can squeeze in and safely hide from you. Spraying the baseboards will also get any cockroach coming out of hiding from behind the wall. Spraying the door and window trims gets any roaches entering or leaving the area through them. Once you have treated the appropriate spots, you need to treat the small cracks and crevices. You will need to get the area in between and behind your drywalls as well. To spray into small cracks and crevices, get an aerosol spray with a straw applicator. The small size of the straw will allow you to blast insecticide into the area and force them to run out. This is where spraying the previous hotspots count. When they come running out, they will run through the treated areas. Remember contact is enough to kill them. To get behind the drywall, you need to get a really small drill bit that will fit the straw. Drill a small hole into the drywall and give it several good blasts of the insecticide. This should force out the roaches that’s hiding behind there. Afterwards you need to set your roach baits in the appropriate places. Having determined these areas before spraying makes this task a breeze. Using these three things will kill the roaches, but you still need to keep the house clean. You’ll also need to correct any problems that may be benefiting or attracting the roaches. My other post about what attracts them explains this in more detail. This method will kill many of them within just hours, but it will take time to get all of them. It will take several cycles where they seem to get smaller and younger. This means the adults are dying out. Also check out the other posts for more methods you can use to increase your results. Lastly, remember that the keys to making this method and any other method the best way to kill roaches are consistency and persistence. Photo credit: Photo by colbolt123. Thank you.